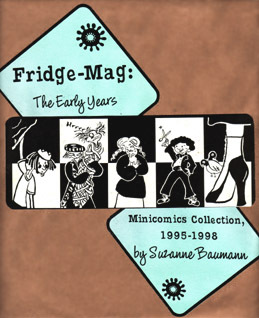 Get Fridge-Mag Comics For Your Very Own! Get something fun in the mail for a change! I also gladly accept trades (comics, zines, music, weird found objects, and pretty much anything created by you); or U.S. postage stamps. Reviewers: Complimentary review copies available upon request. Please send me a sample copy of the printed publication or link to the website where the review will appear. Dealers/Distributors: If you are interested in carrying my comics, contact me to work out a deal. ... and many more fine publications! Cant decide based on the titles? Here are some descriptions. Includes all comics titles listed, plus magnet of your choice, and other nifty surprises! 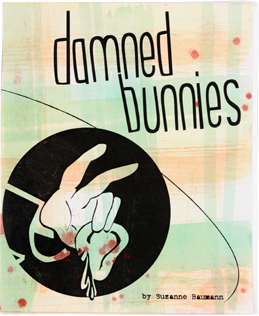 Old favorites Damned Bunnies, Rajiv, Marginalia, Chris Leif, SPIME, Custard King and The Moldy Bagels collected in an attractive envelope!